– What?? I have a friend who lives in Berlin and they love it! So in the light of this introduction, I would love to reveal to you a very special little corner in Berlin. A place where each and every matero(a) out there will surely feel right at home. 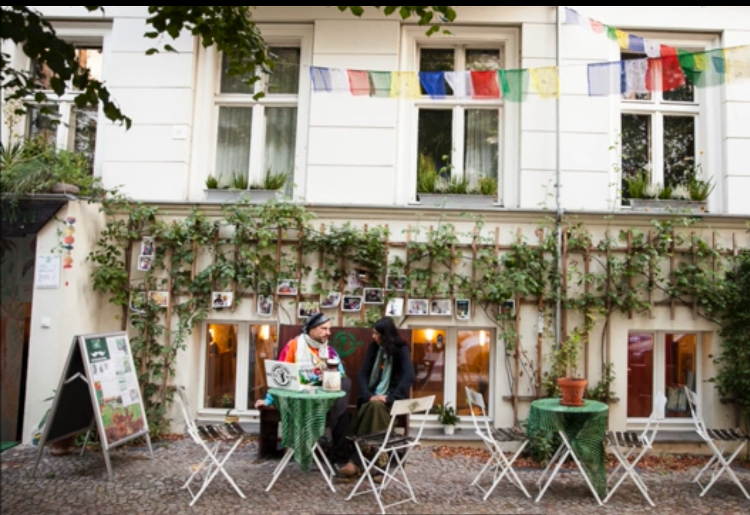 Welcome to Meta Mate Berlin, a paradise for Mate hackers & connoisseurs! I guess it is safe to say that Meta Mate is a mixture of things related to yerba mate. It’s a brand, a mate bar and a cradle for humanizing the yerba mate trade. At the center of all of this is Fabrício and Krithika, a lovely couple whose story I am about to tell. Fabricio do Canto was born in Brazil and grew up with mate culture. After a successful career at Beiersdorf AG, including the patenting of several products, Fabrício moved to India where he met Krithika, an Indian photojournalist who grew up in the United States. Together the two of them traveled the globe for nearly a decade, and carried out several art projects. They are enthusiastic mate drinkers and always ready to share their knowledge with those interested. They harvested their first Mate in 2009 and since then have performed the Mate myth as a theater play in different countries and held lectures and workshops on mate and economy hacking. After nearly a decade of traveling, passing many a cuia around and sharing mate with friends all over the world, they finally decided to dedicate their lives towards their passion and thus was born Meta Mate in July 2011. Meta Mate is developed using cutting-edge products with local artists both in Europe and Brazil and cooperate with industrial partners using state of the art technology. Their yerba currently comes in three different blends: raw, roasted organic and leafy. For more information on this, you can check out their page here. Located in the Strassburgerstrasse 16, it’s just a short walk away from U-Bahn station Senefelder Platz or Rosa-Luxemburg Platz. A great place to learn about yerba mate culture and all things related. There you can let your mate dreams run wild and enjoy some of their delightful Mate creations: which range from MateKati chocolates to Mier–Mate Beer. Pamper yourself with their very own RejuveMate soap and learn how to use Mate for invigorating yourself by combining it with herbs. A popular location for hackers, travelers and passersby. Arrive to a tasty mate delight and leave with a full and authentic yerba mate experience. The best Mate cannot be certified as organic according to EU standards, as they are not on the official certification list of the German Bundsanstalt fuer Landwirtschaft und Ernahrung. According to the Ministerium für Infrastruktur und Landwirtschaft des Landes Brandenburg, there is no official EU Bio Certification for Mate. Producers are free to write Organic or Bio on their Mate packaging, but the official EU Bio Logo cannot be on the Mate package. This means that all organic mate products on the German market should not have the EU Bio Logo on their packaging. Most of the mate that is certified as organic stems from mono-cultures, which means that while you are guaranteed that your mate is free of GMO’s and pesticides (which are not even an issue in wild mate harvests), Organic mate normally belongs to the industrial mate sector. These larger industrial facilities have resources to pay the fees which small producers cannot afford. Small family producers who have been harvesting mate for generations are unable to compete with growing industrial regulations and are often forced to deliver their mate at a fraction of the price to certified producers who then multiply their income under the guise of fair and bio. In order to address this issue and offer a fair deal to both small manufacturers in South America and end customers in Europe and USA, Fabricio and Krithika came up with the concept of Fair Trust Certification. Fair Trust basically means that the consumer is guaranteed complete transparency as to where the products originate from, how they are processed and the financial side of things. They are still starting up, so for more information about this, you should contact them directly. So there you have it! If you are planning to visit Berlin (which I highly recommend) or you happen to already be in the city, do take a moment to pay Fabricio and Krithika a visit. Their experience and knowledge of yerba mate culture will definitely be worth your while!